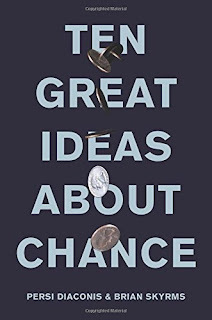 There are few topics that fascinate me as much as chance and probability. It's partly the wonder that mathematics can be applied to something so intangible and also because so often the outcomes of probability are counter-intuitive and we can enjoy the 'Huh?' impact of something that works yet feels so far from common sense. I think I ought to start by saying what this is isn't. It's definitely not an introductory book - the authors assume that the reader 'has taken a first undergraduate course in probability or statistics'. And though there's an appendix that claims to be a probability tutorial for those who haven't got this background, it's not particularly reader-friendly - in theory I knew everything in the appendix, but I still found parts of it near-impossible to read. As for the main text, if you pass that first criterion, my suspicion is that, like me, you will find parts utterly fascinating and other parts pretty much incomprehensible. The authors swoop between engaging philosophical discussions of the nature of probability and the frequentist v Bayesian debate and descriptions of pretty heavy duty mathematical thinking on specific aspects of probability and its applicability. Some of the 'ten great ideas' are fairly straightforward, whether we're talking the early work from Cardano or Bayes' theorem (though, again, the way it's presented here is really surprisingly impenetrable, when it could be covered for more accessibly). But others really strain the non-mathematician's brain. And these can come quite early. 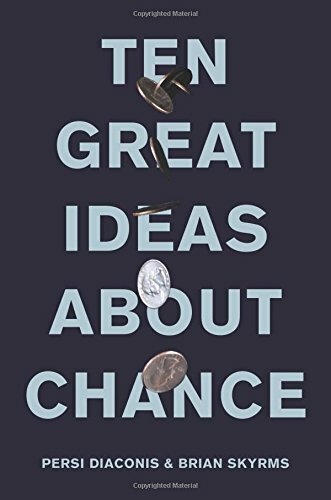 The second chapter opens 'Our second great idea is that judgements can be measured and that coherent judgements are probabilities.' Although I felt I ought to be able grasp what was going on here, I found that the way it was presented went totally over my head. It's just not very well written. So, unless you know much of this stuff already, the chances are you will find some parts hard going - but I found it well worthwhile using the old university student approach of 'just let it wash over you and you'll get to a bit where it starts to make sense again'. This, for me, was the way to cope and the parts I could get my head around were really interesting. I just wish there had been someone involved in the project who knew how to communicate to ordinary readers.